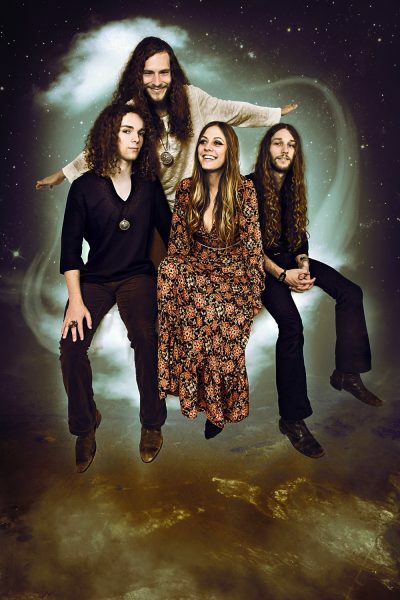 In an interview with desert highways, bassist Zack Anderson comments on the writing process of this album, as it was a little different due to the circumstances of their rising popularity. The band has been non-stop on tour, therefore there was little consecutive time to focus on writing new material. Lady In Gold came together piece by piece over the past two years. Blues Pills have developed their sound to a more embracing celebration of positivity. Singer Erin Larsson is a huge Aretha Franklin fan – Larsson’s gospel charged soul shows another side of her vocal acrobatics. Lyrically, the album is inspired by Kate Bush to come up with more fantastic stories than to write about themselves. The opening track ‘Lady in Gold’ steers away from the cliché personification of death as a grim reaper. In this song, death is a dazzling lady in gold. The first few piano notes are merciless and announce the integrity of Blues Pills newly found sound. Yet there are a lot of experiments with effects on instruments and nicely tucked in percussive details, from shakers to oral percussion to the use of xylophone. For those who fell for Blues Pills for their heart-aching, raspy blues rock, the songs ‘Gone So Long’ and ‘Burned Out’ embody that raw sound as an echo of the first album. 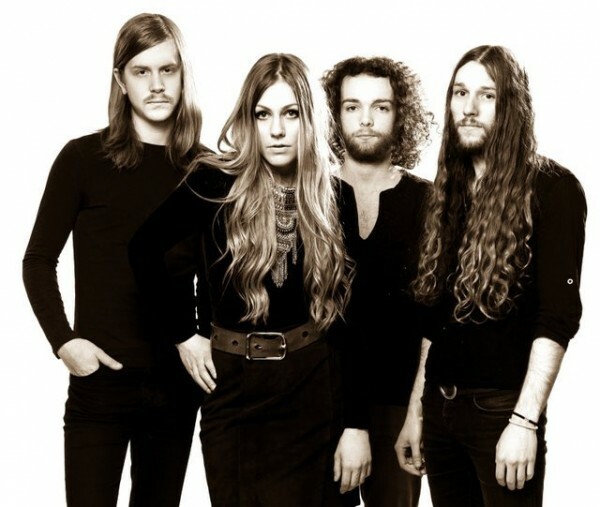 Blues Pills went back to the same studio and producer Don Alsterberg as on the debut album, who has also worked with Swedish blues rock kinsmen Graveyard. What makes these two bands stand out from other modern bands pursuing the 60’s and 70’s sound is the authentic ring of their music. The warm, but slightly muddy tone is materialized by analogue reel-to-reel tape recording. The sound is clear enough to hear all those meticulous, devoted details but has this imperfect and sincere tone to it that addresses what’s it like to be human. The second half of the album beholds many elements that perplex the listener. ‘Bad Talkers’ has almost an air of latin music, ‘Won’t Go Back’ shows prog rock influence in the construction and ‘Rejection’ sparks a curious, almost synthy guitar sound. The album closes with ‘Elements And Things’, a Tony Joe White cover. 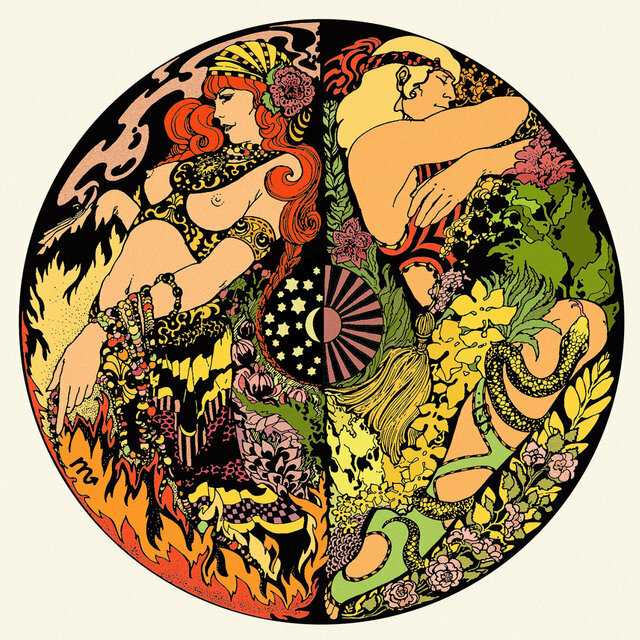 All in all Lady In Gold can be embraced as a part two of their debut Blues Pills – only with more soul and less blues. The red lining of this album lies in the layered vocals, gospel choirs, 60’s organs and heart beating rhythm. 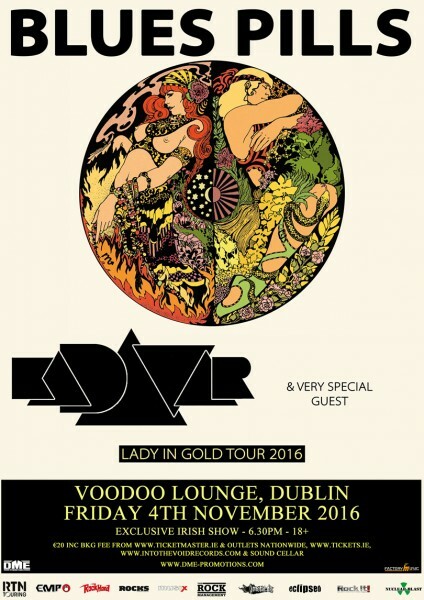 Blues Pills will be playing Dublin’s Voodoo Lounge for their only Irish show on Friday November 4th with special Kadavar. Tickets are on sale now from Ticketmaster, Tickets.ie and Sound Cellar. Please check DME Promotions for more details. Lady In Gold is out now via Nuclear Blast, and available in digital format and on vinyl. Get your copy here! Read more and stay in touch with latest updates on Blues Pills official website.